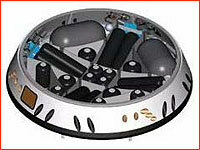 A defining feature of Russia's new-generation PPTS spacecraft would be its landing system. 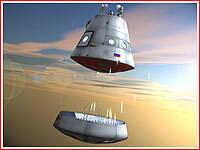 Due to the political requirement to land future manned missions in Russia, while the spacecraft would barely overfly the south of the country, a lot of maneuverability would be required from the descent module. At the same time, tough deadlines imposed on the development of the vehicle and limited funds, left little room for radical solutions. As envisioned in 2008, during its three-hour trip back to Earth, the ACTS/PTK spacecraft would conduct a deorbiting engine burn to slow itself down by 130 meters per second. The service compartment would then be jettisoned to burn up in the atmosphere, while the crew module would conduct a 40-minute reentry and touchdown with the help of solid-propellant soft-landing engines. (300) Combined with retractable landing legs and a reusable thermal protection system, 12 solid-propellant landing rockets promised to enable not only safe return to Earth, but also the possibility of multiple space missions of the same crew capsule. 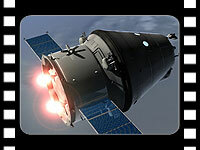 According to the presentation made by Nikolai Bryukhanov, the leading designer at RKK Energia, at the 26th International Symposium on Space Technology and Science in Hamamatsu, Japan, in the summer of 2008, the spacecraft would fire its engines at an altitude of just 600-800 meters, as the capsule was streaking toward Earth after reentering the atmosphere at the end of its mission. After a vertical descent, precision landing would be initiated at an altitude of 30 meters above the surface. Not surprisingly, Russian engineers found themselves under political pressure to improve the maneuverability of the future spacecraft, so it could guide itself into a circular landing area with a radius of only two kilometers, instead of being at the mercy of winds, when landing under a parachute in the endless flatlands of Kazakhstan. Radical solutions like aircraft shapes and "transformers" with deployable wings were deemed too expensive and technically risky, given the concurrent requirement of the Russian government to have the new spacecraft ready for a first manned mission in 2018. 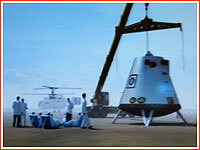 Eventually, a capsule with rocket-assisted landing emerged as a winning combination, promising to keep the predicted touchdown to a piece of land of only two by five kilometers. As of March 2009, in its official requirements for the PPTS system, Roskosmos "relaxed" its requirements for the accuracy of the PPTS touchdown to 10 kilometers, while still directing the industry to continue studying various alternative modes of high-precision landing. In any case, the crew capsule had to have a capability to conduct an emergency return to Earth either from orbit, or during a powered flight to orbit, with the ability to touch down in any season on any unprepared piece of land or at sea, the agency's requirements said. Emergency escape and landing capabilities were mandated for every phase of the mission and had to provide the survivability of the crew until the arrival of the rescue and recovery teams. As an alternative solution, RKK Energia representatives reportedly considered a nominal splashdown of the new spacecraft into the Pacific Ocean, instead of the traditional land-based landing practiced by the Russian manned space program since its inception. Water landings would be supported by rescue and recovery ships, which would have to be deployed in the Pacific anyway to provide emergency services to the crew in case of an accident during launch from Vostochny. However such a proposal apparently would still fail to eliminate the requirement for a powered, high-precision landing, since during the initial phase of its flight from Vostochny, the spacecraft would overfly the evergreen forests of the Russian Far East, and in case of emergency, would have to be able to steer itself into a limited size landing area. 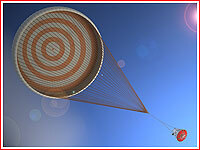 As yet another option, a parachute was proposed for use in case of emergency. However, due to weight restrictions on the parachute landing, it was necessary to separate the reentry vehicle into a 4.5-ton crew module and a bottom propulsion section. 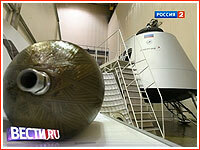 The landing hardware kit, known by the Russian abbreviation KSP, including the parachute, was expected to weigh around 250 kilograms. 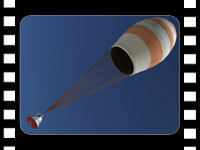 In case of problems with the soft-landing engine, the propulsion section would be jettisoned and the crew module would land under the parachute. This method apparently became a favorite by April 2009. Still, skeptics of rocket-powered landing claimed that developers would eventually return to traditional parachute landing. On June 2, 2010, RKK Energia released a vague statement, which contained a rather typical reaction to recent coverage of the PTK NP project in the Russian press, especially, doubts expressed by observers about the rocket-powered landing. While providing little information on the current state of the project, the press release dismissed unnamed press reports as "authors' speculations based on previous phases of the spacecraft development." 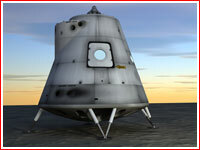 The document went on saying that the company and its contractors had come to the conclusion that a "parachute-reactive" landing would be the most suitable for the reentry capsule, known as VA. It hinted that some sort of combination of a multi-cupola parachute system, rocket engines and retractable landing legs would be employed to control vertical and horizontal motions of the capsule during landing. However, as it transpired, the approved preliminary design of the PTK NP still called for nominal landing under sole power of rocket engines, while parachutes would be employed in an emergency only. Therefore, the basic concept of the rocket-powered landing, as it was envisioned in 2008-2009 had not changed, as the June 2 statement implied. The RKK Energia statement also said that an effective, quick-disconnect and expendable thermal shielding had been developed, apparently referring to a jettisonable heat shield protecting the landing gear. The architecture of the spacecraft was updated and new progressive technologies were proposed with a spin-off potential for aviation and other industries, RKK Energia said. 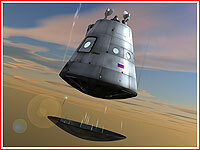 During the 61st International Astronautical Congress, in September 2010, Aleksandr Krasnov, the head of the manned space flight directorate at Roskosmos, told the editor of this web site that the ship’s nominal landing profile would use a combination of parachutes and rocket engines. According to sources at RKK Energia, the prime developer of the next-generation spacecraft, the debate on the exact design of the landing system of the future spacecraft still continued. Few weeks later, Vitaly Lopota, president of RKK Energia, confirmed that a combination of rockets and parachutes would be used for landing. The accuracy of landing was still cited at two kilometers and the primary location of landing remained in the vicinity of the Vostochny launch site. However, no detailed technical information on the landing system and its functioning during nominal and emergency flight modes had yet been released at the time.